Remove vocals and voice from a song, adjust key and tempo. Merge or clip karaoke songs. All these karaoke sound tools can be fine-tuned in real-time, and work with MP3, WAV, BIN, and CDG files. 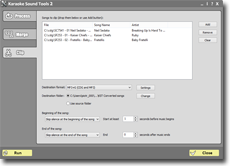 If you use a karaoke BIN or MP3G file and use our tempo changer, the graphics part of a song will be adjusted so the lyrics are in sync with the slower or faster version of a song. No other software has this feature! Merge allows to combine several karaoke songs into one medley. Clip allows to remove starting and ending part of recording. 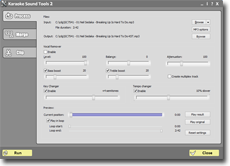 This karaoke software contains tools that other companies are selling separately at extremely high prices, and yet they cannot match the quality and ease-of-use of Karaoke Sound Tools 2. Do not take our word for it. Download the evaluation version now and listen to results yourself. We recommend Windows 10 to run our software. It also works on Windows 8, Windows 7, Vista, and Windows XP. Needs at least 2 GB RAM. It will not work on Mac. Karaoke Sound Tools 2 costs $49 USD. If you own any other our software, you get a $10 discount on your purchase.